The Olympus 90-250mm f/2.8 ED Zuiko Four Thirds Lens features a large maximum aperture throughout the entire focal range, making it very suitable for indoor and lower-light shooting. 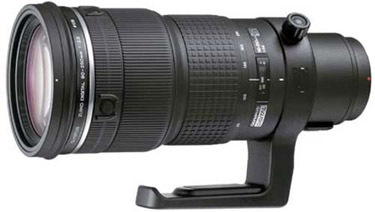 It is ideal for Four Thirds wildlife and sports shooters and also a good choice for stadium and arena events. This is a Four Thirds mount lens. If you are a Micro Four Thirds shooter, please see the Notes tab. • This lens is for Four Thirds mount only. It is not compatible with Micro Four Thirds mount. • If you want to pair this lens with a Micro Four Thirds camera, you can do so with the Olympus MMF-3 Four Thirds Lens to Micro Four Thirds Camera Adapter. But please note that AF performance will diminish.